In the previous lessons you developed HyperLinkGroup control. The control is working as expected but it has one limitation. It can't retain its state information across post backs. For example, if you set the SourceFile property programmatically to some other XML file then across post backs it won't remember the new file name. In this lesson you will learn two ways to overcome this limitation. Before we go further first of all let's make the problem clear with an example. Open the same HyperLinkGroup control that you developed in Lesson 1. Add a new XML file to the web site and name it as Links2.xml. Key in the following markup in the Links2.xml file. The structure and nesting of Links2.xml is same as Link.xml but the data is different. The above code simply sets the SourceFile property of the HyperLinkGroup control to the new XML file. 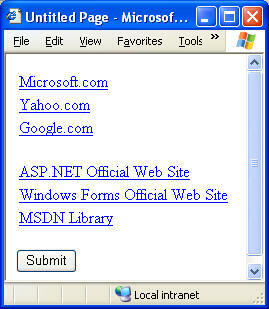 Drag and drop a Button control on the web form and set its Text property to "Submit". You will use this button simply to cause post backs to the web form. Run the default web form and try hitting the Submit button. What happens? When the page loads for the first time it correctly renders the hyperlinks as per the new XML file (see below). 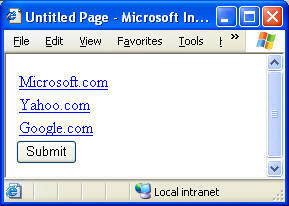 However, when you hit the Submit button the HyperLinkGroup control renders links from the older XML file i.e. Links.xml (see below). This proves that across post backs the HyperLinkGroup control is unable to persist the property values or any state information in general. One solution to the above problem is to use ViewState object. You might be aware that ASP.NET uses ViewState to save control values across post backs. The same ViewState object is also available to your custom controls. Let's modify the HyperLinkGroup control to use ViewState object. The following code shows a class named HyperLinkGroupWithViewState that is the modified version of the HyperLinkGroup class. Most of the code of HyperLinkGroupWithViewState class is identical to HyperLinkGroup class you created earlier. However, observe the SourceFile property (marked in bold letters). Earlier it used to store the specified file name in a local variable strSourceFile. Now it stores the file name in the ViewState. The ViewState object is like dictionary or hashtable. While storing values you specify some key and while retrieving them you use the same key. Remember that ViewState saves all the information as object and hence you need to type cast it as per your requirements. Now use the HyperLinkGroupWithViewState control on the default page instead of HyperLinkGroup control. 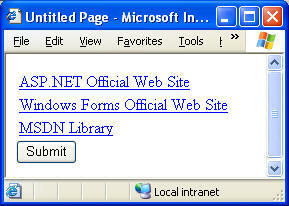 Run the web form and try clicking on the Submit button. This time the control correctly renders links from Links2.xml file even after post backs. Though the ViewState approach that you used above worked well it has a drawback. The ViewState can be disabled by the users of your control using EnableViewState property. If EnableViewState property is set to false then your control will not remember state information at all. Even if you store something in the ViewState object it will be discarded before rendering the page. You can try this out by setting the EnableViewState property of HyperLinkGroupWithViewState control to false. By default control state is not available for your control. This makes sense because the control state is designed for critical data. The data without which your control cannot live. One should use the control state carefully. Don't dump each and every piece of information you wish to store in the control state. To enable the control state for your control you need to register the custom control with the page framework for control state. You do this by using RegisterRequiresControlState() method of the Page class. You typically call this method by overriding OnInit() method of the Control base class. The following code shows how this is done. The RegisterRequiresControlState() method accepts the control for which the control state is to be enabled. Once enabled you can save state information in the control state. In order to save state you must override SaveControlState() method of the Control base class. The following code shows how this is done. The SaveControlState() method returns an object containing state information. Inside the SaveControlState() method we first call SaveControlState() method on the base class. Then we create an instance of Pair class. As the name suggests the Pair class combines a piece of information to the existing state. In our example we combine existing state (if any) and file name (strSourceFile). If you wish to store multiple pieces of information then you need to create multiple Pair instances. Finally, the newly created Paid instance is returned from the SaveControlState() method. The LoadControlState() method receives the saved state information as an object. Inside we type cast this information to Pair class (recollect the we returned a Pair instance in SaveControlState() method earlier). The Pair class has two public members - First and Second. The First public member returns the first object to which we combined some state information whereas the Second public member returns the piece of information that we combined with the first object. In our example the Second public member will return the file name. We store this file name to the strSourceFile variable. The following code shows the completed class (I have renamed it as HyperLinkGroupWithControlState for the sake of clear understanding). In order to test the HyperLinkGroupWithControlState control create its instance on the default web form. Set EnableViewState property to false and then run the web form. You will find that even though the ViewState is disabled this time control correctly remembers the new XML file. The above figure shows the HyperLinkGroupWithControlState control in action. Observe how HyperLinkGroupWithViewState shows the older links after disabling the ViewState whereas HyperLinkGroupWithControlState still shows the new links.